A NEW THRILLER AT GREAT INTRODUCTORY PRICE! It looks like Julie’s left her wealthy husband for good. Cam’s spent too much time away, the couple’s been bickering, and Julie’s father just died–but could this be enough to make Julie leave? Detective Jack Deerfield thinks so, but Cam disagrees…until he finds romantic letters sent to Julie by a mysterious lover. While Cam deals with this betrayal and Deerfield discovers feelings for Julie’s African-American friend, Evanna, Julie is forced to endure a mentally unstable man bent on turning her into an obedient and loving companion. Will Cam, crushed by his wife’s apparent abandonment, fall under the spell of a seductive socialite determined to make him break his marriage vows? And, will Julie, alone and afraid, find the key to unlock her prison door before she’s subjected to her captor’s last and most dangerous form of control yet? 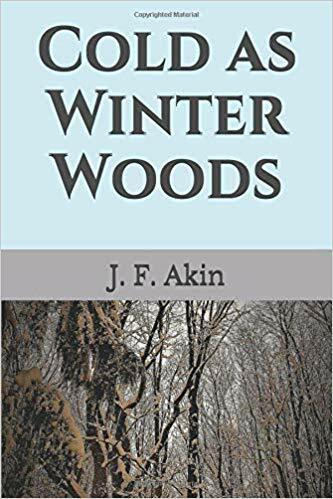 Head over to Amazon.com, pick up the thriller Cold as Winter Woods by J.F. Akin, and find the answers to those questions! Only $9.40 for the beautiful hefty Paperback! Only 99c for the Kindle eBook, or ZERO cents if you buy the eBook with your Prime membership!! If you get the thrill from the novel that my initial, pre-publication, readers have reported to me, I’d appreciate it very much if you’d go over to Amazon and give me some stars. It’s hard work writing a novel, as many of you know, and encouragement from fellow writers and faithful readers means a lot, so THANKS! !